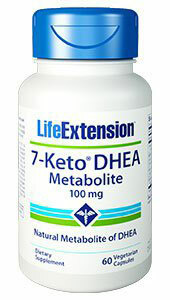 7-Keto® DHEA is the brand name for a natural metabolite of DHEA, your body’s most abundant circulating hormone. DHEA production peaks in one’s twenties, but steadily declines thereafter. Lower level leads to age-related hormonal imbalances that can affect quality of life. DHEA is largely known as anti-aging hormone as higher levels are associated with numerous health benefits. Low levels are also associated with high stress and high cortisol levels. Both DHEA and cortisol are produced by the adrenal glands. Patients with Adrenal Fatigue and especially, Adrenal Burnout should consider supplementing DHEA under the care of their health practitioner. I prefer 7-keto DHEA over regular DHEA because in the 7-keto form it is already metabolised and thus there are less risks of the side effects commonly associated with taking regular DHEA. Not recommended for women under age 40, unless abnormal levels of low cortisol levels are detected due to Adrenal Fatigue or Burnout. Not recommended for women with PCOS or who are pregnant or lactating. Not recommended for males under age 20.